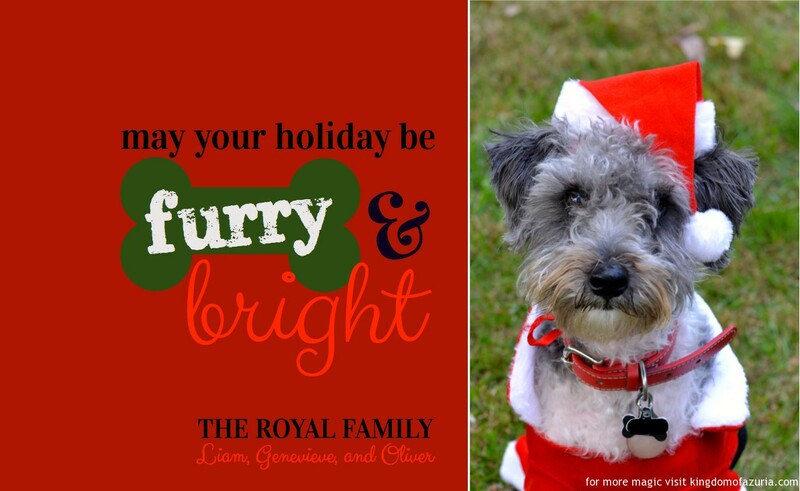 Download your FREE Puppy Christmas Card Design Furry and Bright. Welcome to the Kingdom of Azuria. We know you’ll love this free Puppy Christmas Card Design. We made our furry puppy prince the highlight of our Christmas card this year. In our family photo he’s dressed at St. Nick. 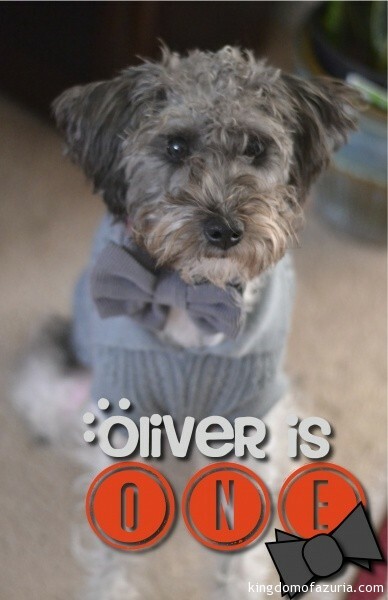 You can easily switch out our photo for your’s once you download the Christmas card file. If you have yet to get your christmas cards sent, then this is just in the knick of time. It’s so quick and easy to customize this for your family. 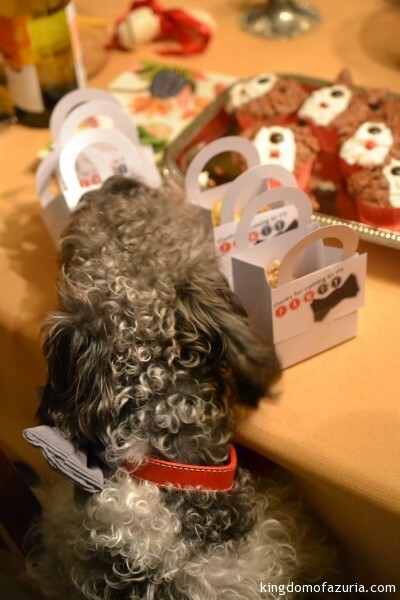 You may recognize the bone design from our Puppy Party post. 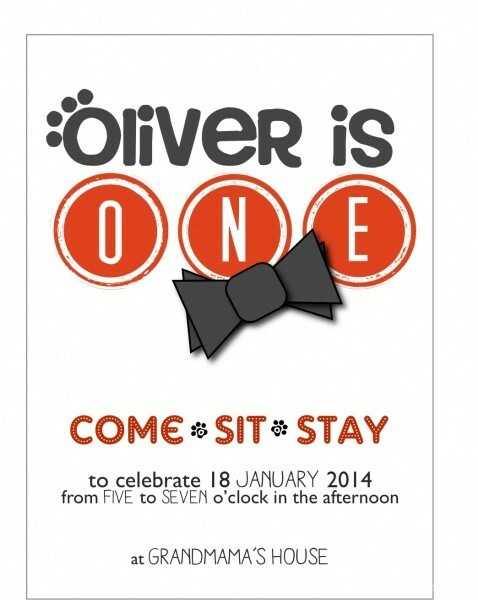 If you’re a dog lover like the royal family, you’ll want to hop over there and download your free Puppy Party invitation, too. Oh and just in case you missed them, here are two more free Christmas downloads Santa at the Palace Coloring Page and Reindeer Food for the lawn on Christmas Eve. May your holidays be Furry and Bright and may all your Christmas be white. Take a peek at Princess Genevieve’s pumpkin! The Royal Carvers worked hard this weekend to create something to match the Royal Family’s Halloween costume plans… can you guess what they will be this year based on this pumpkin hint? This was a fairly easy design because the Roman Numerals are all linear. We suggest cutting the XII, IX , VI, III marks first (We totally goofed on our III’s rotation –oops.). Then we carved the minute and hour hands before filling in the additional numbers. 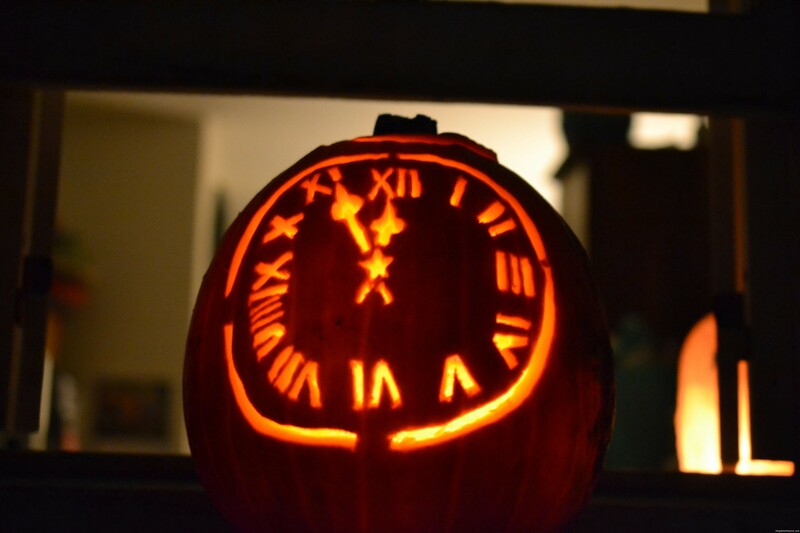 Last was carving the circle frame – be mindful to leave a holding place on the circle’s edges, so your pumpkin clock doesn’t cave in as the pumpkin ages. 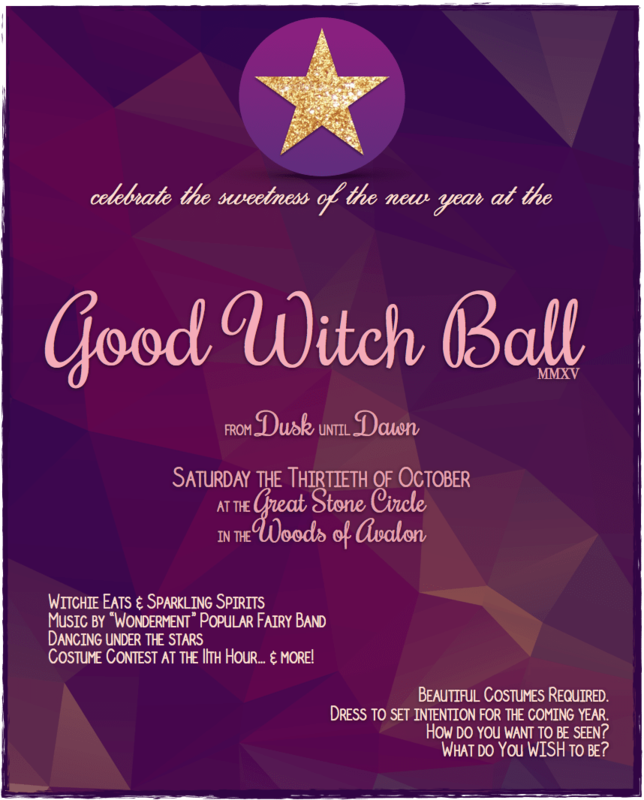 Here’s another to help you guess our costumes this year.. it is not traditionally a “Halloween” story. Since the weather warmed, I’ve been going through phases of herbal flavor obsessions. During the spring and early summer it was Rosemary! I was clipping bunches of the herb from our garden to add flavor to homemade deli sandwiches, fresh salads, and pastas. Which is why I was so enchanted with the refreshing and earthy Rosemary Tea we drank in at the Olive Press Museum in Naxos, Greece this June. –Must remember to ask Nicoletta for the recipe! As summer steamed on, I became entranced with the lovely and intoxicating flavor of lavender. If you know me, you know I carry around a vial of lavender essential oil in my purse at all times. I adore this scent and the wonderful aroma-therapy benefits and bug-off abilities it offers. 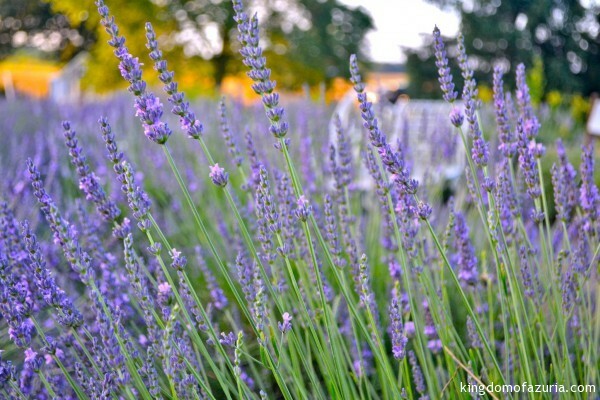 I also love getting lost in the lavender fields of Seven Oaks, the lavender farm in Catlett, VA. In addition to sharing their newest precious baby animals (bunnies, goats, etc. ), this wonderful setting always serves a refreshing lavender lemonade for guests. Ah, to drink that calming fragrance on a summer Sunday! Since we were traveling and I missed the lavender picking season this year, I decided to make my own. I must admit, my original post, planned for two weeks ago, was thwarted! I made the first batch – and before I could even get a photo of this delightful pale pink beverage, chilled on ice, in our blue Mason Jar glasses with a cute chevron straw, the King of our castle finished the pitcher. Hehe. I was happy he enjoyed it so much! Here’s the simple recipe. Now on to making lavender everything! Boil water. Add sugar and stir until dissolved. Before water cools, squeeze in lemons and desired amount of lavender flowers. Allow to steep at least five to ten minutes. The water will turn a light pink color. Strain the lavender flowers and lemon pulp (I use the smallest of these wonderful Cuisinart Strainers we received as a wedding present from my cousin.) and allow the mixture to chill for about an hour in the refrigerator. 1. As for the amount of sugar, lemons, and lavender to add. The list above is just a suggested amount. I use more or less of this depending on who I am making it for. Some like sweet-sweet and others like tart. I’m probably the worst, and shouldn’t be writing a recipe for sure, as I am a taste as you go kind of kitchen creator. Experiment, and you’ll find what’s best for you. 2. I will warn those who are new to the flavor; this is going to have an earthier taste than you may be accustomed. The same for any herb based drinks. We are so used to smelling lavender in bath salts or Herbes de Provence- so you might not even like it at first. 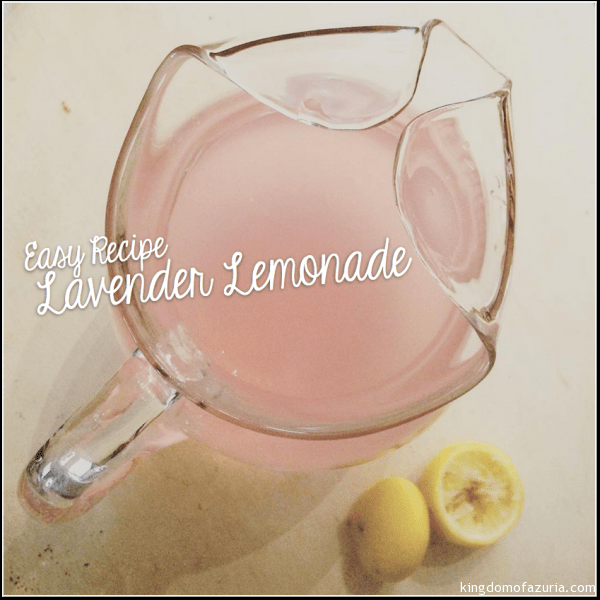 I read a post about lavender lemonade, where someone described it as tasting like soap! I can understand where they are coming from. So if you’re new to this flavor, try a little lavender at first, and add more to the next batch, as you get used to the taste. If you’re hosting an adult summer BBQ add a little Organic Vodka to the full pitcher and stir. I made this when the Queen Mum visited and she loved it! Let us know how you liked the drink – especially if you’re new to herbal drinks. I hope you will grow to love this soothing flavor as we do. Have you ever dreamed of your own fairy land? 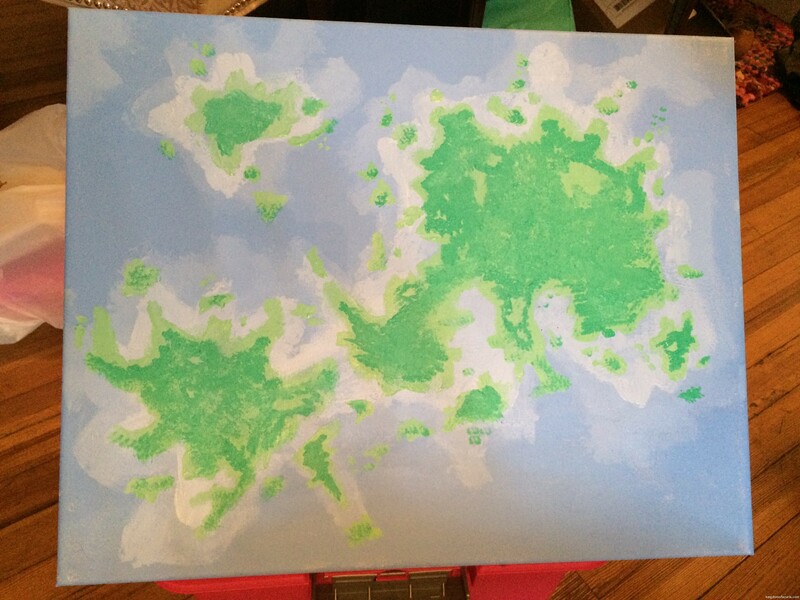 Wouldn’t it make it all the more real if you had a map of this enchanting place that lives in your mind?? 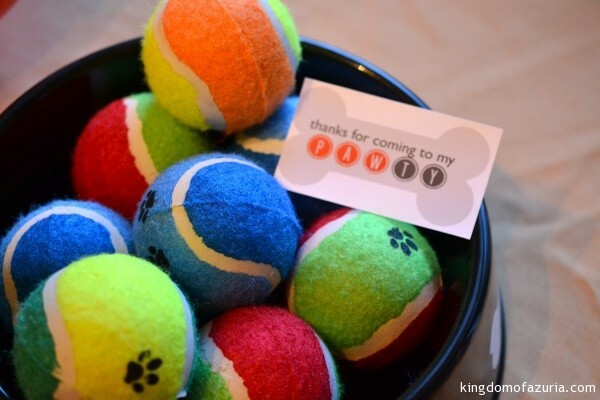 This activity is perfect for a chilly winter day. 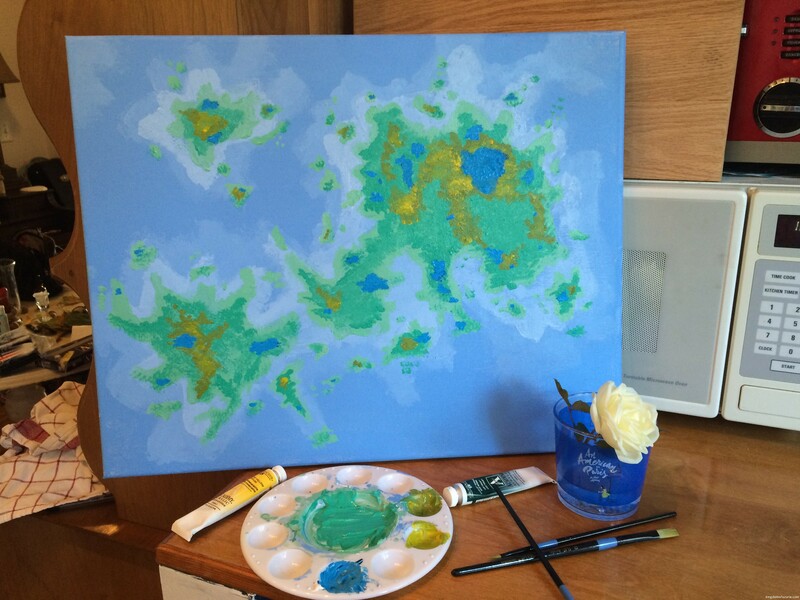 Grab a canvas, your earthy paints, paintbrushes of all sizes, a good podcast, and you’re ready to go. 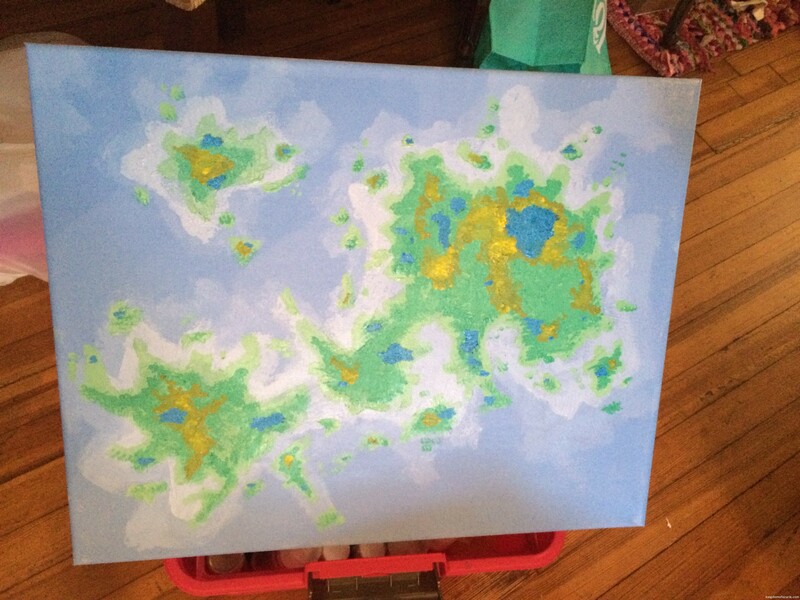 This project would be perfect for a magical Waldorf creative activity or a cartography lesson in georgraphy class. Kids love to make things from the real world their own. 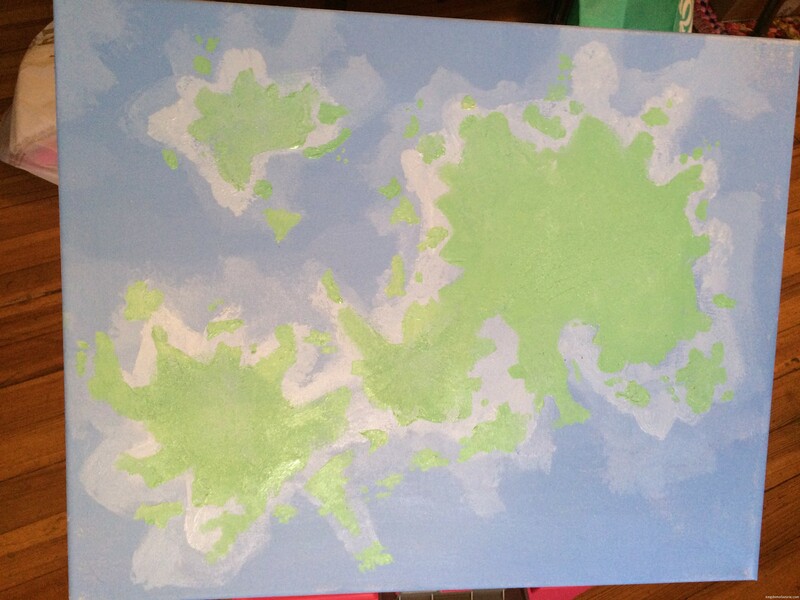 Add mountain height by mixing varying shades of browns and yellows, and lakes with hues of blues. This would be great in a kids’ bedroom or playroom! 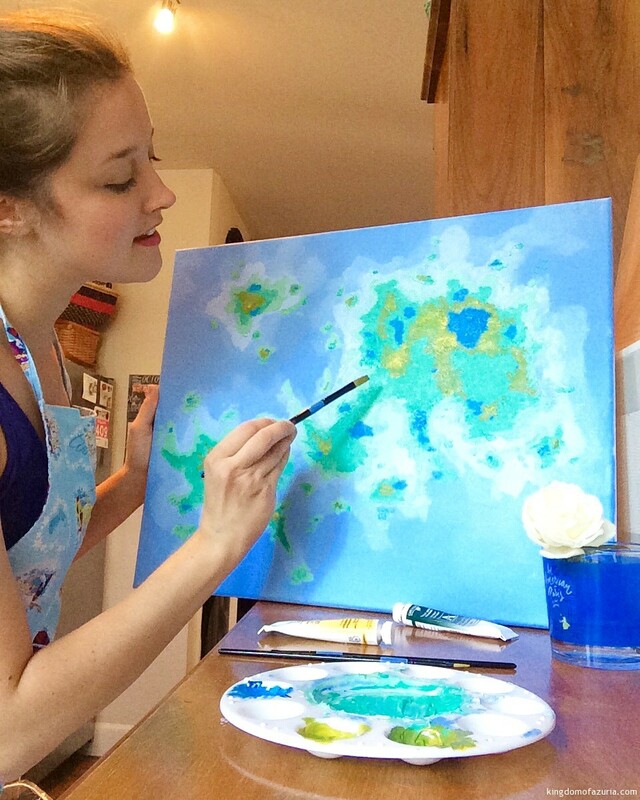 Have fun with your paintbrush as you create the story behind each little island of your very own Kingdom. I hope you’ll come visit me in the magical Kingdom of Azuria very soon.